It seems that there are more western bottles that I know little or nothing about, than those I do. Here is one that I have not been able to find ANY information on. This is a relatively large medicine with an applied top. It is embossed " Frizelle Bros.Manuf'g Chemists, San Francisco, Cal". The height is 9" tall. The top is interesting in that it is almost a "wrap around" style with green streaks throughout. This example was found in California and I have not seen another. I would appreciate any information on this one. Thanks! Dale M.
I have been aware of the Frizelle Bros. bottle for a few years now and the specimen shown at the 49er event in Roseville is the only one I am aware of, but there are probably others in Michigan. The Frizelle brothers were Seymour Fuller Frizelle and Charles Samuel Frizelle. Natives of New York, they began a drug business in East Saginaw, Michigan in the early 1860's. Plagued by fires that roared through the town, it is likely that is what contributed to the business failure. In 1871 Seymour Frizelle declared bankruptcy and by 1875 he had located in San Francisco where he was working as a drug clerk for William H. Wood. Charles stayed in East Saginaw. After a few years Seymour operated his own drug store in San Francisco and also opened a steam bath. By December 1879 Seymour moved back to Michigan and rejoined Charles in the drug business, as Frizelle Brothers. In fact, there may have been a continuing partnership with the brothers even while Seymour was in San Francisco, based on the lettering found on the subject bottle. No advertising or newspaper information has been found to determine what was contained in the bottle while Seymour Frizelle resided in San Francisco. It appears the bottle was made to contain a variety of products. Only after Seymour Frizelle moved back to Michigan does this picture become a little clearer. Upon his return, the first advertisements appeared that link this all together. 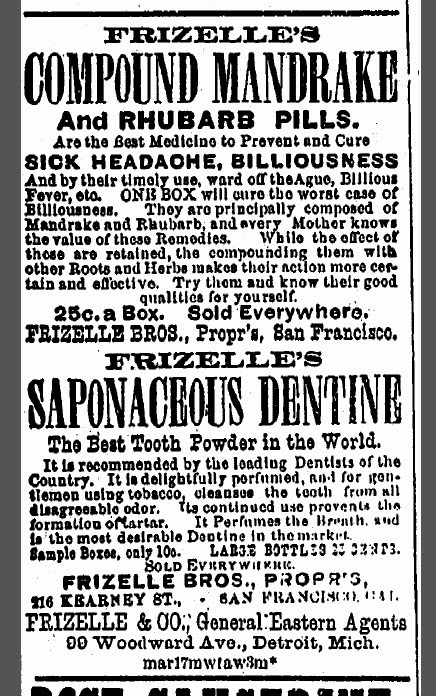 The Michigan newspapers soon began running advertisements implying that the Frizelle Brothers were located in San Francisco, even though neither of the brothers were located there at that time. It is obvious that the mold for the bottle was manufactured in San Francisco, but what is not clear is whether any bottles were actually blown there. This is clearly a guess, but based on the appearance of the glass and style of the top finish, it may be possible that the Frizelle bottles were actually blown in the Midwest. I am not sure where this bottle was found but another example has been noted online in a "hazy" condition. At any rate, the bottle represents an interesting piece of history as information unfolds about the Frizelle Brothers. I have seen this bottle but I'll be darned if I can remember where. Eric McGuire might have some information on the Frizelle company. Thank You Eric! Dale M.